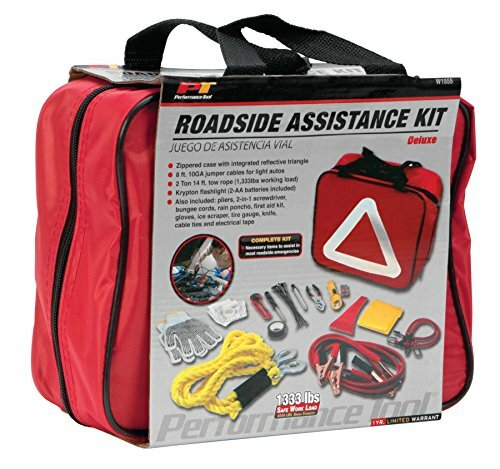 This great emergancy kit includes 49 pieces with an assortment of 15 items. 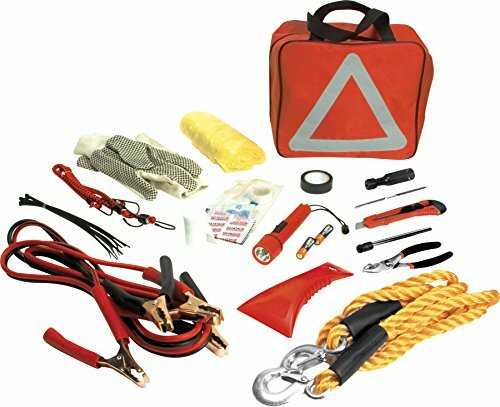 Kit includes 1: 150 AMP 10 GA 8ft jumper cables, 1: 6 inch split joint Pliers, 1: Roll of Electrical tape, 10: 9 in cable ties, 2: 18 inch bungee cords, 1: Rain poncho, 1: 23 piece first aid kit, 1: pair of knit gloves, 1: Krypton flashlight with batteries, 1: ice scraper, 1: pencil tire gauge, 1: 2 ton 14 ft. tow rope, 1: snap blade knife and 1: nylon zipper case with reflective triangle. This is a must have kit to be ready for any emergancy while driving.